Breathtaking views of Fox Island & Puget Sound await you at this exquisite 4,900 SF home, on an impeccably landscaped lot with room for your garden & chickens! The flexible floor plan adapts to your lifestyle, w/ main floor master suite feat. sliding doors that lead to the view deck, where you'll enjoy stunning sunsets! 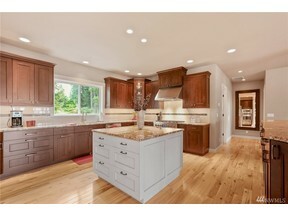 Chef's kitchen w/ commercial grade appliances, 3 bdrms & bonus room upstairs, lower level ready for a 5th bdrm & plumbed for 2nd kitchen, & 5-car garage for the car enthusiast!